Well, here is my first real upholstery job. 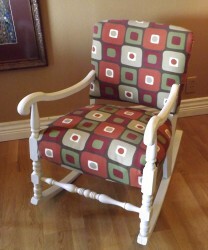 If you recall, the previous chair upholstery project was done over the old fabric. This time I did it “right”–or as right as a non-professional can. A professional upholsterer would be shocked, I’m sure, with this video. I had to take apart the top part of the rocking chair twice, and then make a cover flap to hide a mistake (the video shows part of this oops). Hopefully this won’t discourage you from trying to upholster a chair. Maybe it will give you more courage to try, knowing you can make mistakes and still end up with a lovely piece of furniture! The key to allowing for mistakes is to cut your fabric much larger than you actually need. In my case, this allowed me to move the fabric over so my fatal mistake became a hideable mistake. Let me know if this encourages you to try a home upholstery project! Eu senti assim também, Hellen. E não só a primeira vez que cubri uma poltrona. É sempre um desafio. Uma dica que te vai ajudar muito: use mais tecido do que voce pensa necessário. Sempre vai acontecer acidentes, e é bom ter tecido à sobras para desfazer e re-fazer a parte que não deu certo, ta? Quero ver o resulatdo. Pode postar no meu Facebook DIYandSAVE. Wow, what a beautiful chair upholstery job! Where did you find that chic retro fabric? I love it.